Allie Mae is an almost 10 year old Berman. 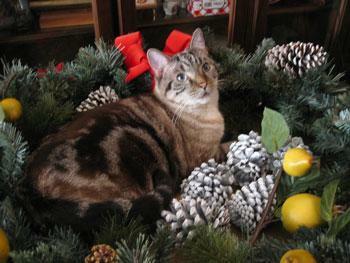 We got Allie Mae when we lived in St. Louis, MO about 10 years ago, I bought her from a Vet there. Allie likes to chase bugs around the house and taunt and tease Max and Sadie (our 2 Rottweillers) at the various windows of the house. Allie Mae is an indoor only kitty and Max and Sadie are outdoor only. But they have a great relationship through windows and screens. She likes to get them in trouble by making them bark at her. For those who are not familiar with the Burman breed, they are the ultimate lap kitties. Allie is only 7 lbs. and loves to be held, follows us around like a puppy and sleeps with us. They are the sweetest, most loving cats. 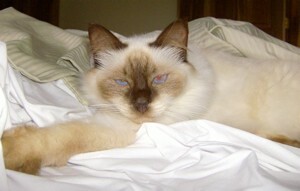 The Rag Doll cats were bred from the Burman. What a pretty girl she is. I really wish our cat, Sir Catty-Kit was more of a lap-kitty, and he was when he was a baby. He'd come to me to be rocked to sleep even. When it was cold weather, I'd wrap him in a warm towel, and rock him just like he was a baby. Then he grew up and is now 5 years old. He no longer wants me to hold him at all, but still wants my attention. He gets brushed every day sometimes more than once, and he wants to sleep right up against me. he is a "man" now and not a baby anymore. He is very good at communicating just what he wants and can be very verbal and very loving. He takes really good care of us "old folks". I miss my lap "baby" though.